Home / FACTS / RuPaul Announces He’s Ron Paul and He’s Not Running For President! 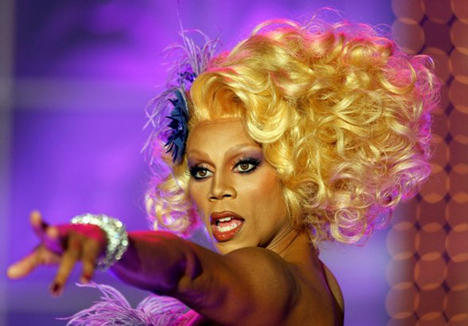 RuPaul Announces He’s Ron Paul and He’s Not Running For President! RuPaul Visits The Granite State, more specifically the Red Arrow Diner in Manchester, NH to announce that he is not running for President! “I am not Ron Paul!” shouted RuPaul, the famous drag queen (wearing men’s street clothes), at the top of his lungs inside a cramped diner here, a picturesque little restaurant that presidential candidates have visited for years. “And I am not running for president of the United States!,” he added. Sleepy locals sipping their coffee looked up from their cups. What the hell? And what was RuPaul doing in chilly New Hampshire just days before the state’s first-in-the-nation primary? The back story: When Ron Paul first ran for president as a Republican in 2008, a picture posted online of a Ron Paul campaign sign altered to say “RuPaul for President 2008” spawned a viral joke that the septuagenarian statesman from Texas was actually RuPaul, the black drag queen. Now that Ron Paul is ranking at the top of the polls, after placing third in the Iowa caucuses, RuPaul is here to capitalize. Leaving Los Angeles behind for a few days, he’s traveling the state “campaign-style” with television cameras in tow to prove once and for all that he is definitely not Ron Paul. The tour will feature in his reality TV show, “RuPaul’s Drag Race,” which airs on Logo. RuPaul Political policies change like hemlines & hairstyles. How the hell is anyone expected to take them seriously? RuPaul Cheap publicity stunt? I’ll have U know that I flew here first class!